The British Embassy in Hanoi and the Market Surveillance Agency under the Ministry of Industry and Trade today announced that they will work together to increase the effectiveness of Intellectual Property Rights enforcement in Vietnam. The Grant Contract Signing Ceremony between representatives of British Embassy Hanoi and Vietnamese Market Surveillance Agency. 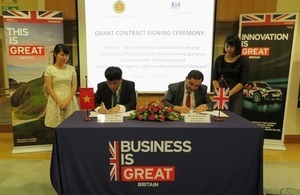 Under a new project funded by the UK Government’s Prosperity Fund they will seek to enhance coordination among Intellectual Property Rights (IPR) enforcement agencies to reduce IPR infringements, leading to an improved business environment for domestic and foreign-owned enterprises, including British investors, in Vietnam. With the support of the regional intellectual property advisor and experts from the UK’s Intellectual Property Office, Market Surveillance Agency (MSA) will hold training courses for investigators of enforcement agencies, workshops between the public and private sectors to raise IPR issues and make recommendations to strengthen the effectiveness of enforcement activities. This work will contribute to the forthcoming Decree guiding the implementation of the Market Surveillance Ordinance and setting out a clear organisation structure for MSA at both the central and provincial levels. I am very pleased that Vietnam is among the first countries to benefit from the new £1.3 billion Prosperity Fund announced in November 2015. The United Kingdom has been ranked second in the Global Innovation Index for 2015 and has an outstanding tradition in producing the very best in science and research. So the UK has a special interest in IPR and has developed considerable expertise on enforcement which we are sharing with Vietnam. I am confident that IPR enforcement will be improved in the near future creating favourable conditions for investors. After the successful implementation of the project on strengthening the effectiveness of IPRs enforcement in Vietnam in 2013 and 2015, nearly 400 investigators have been trained and given guidance on how to assess IPR infringements using practical case studies; a curriculum on IPR enforcement and a database on distinction of counterfeit – genuine product were developed. In 2016, the project will be more focused on coordination mechanism and capacity building at local level. We hope and believe that the IPR enforcement will be improved and coordination between agencies will be more effective. (ii) fostering an open and transparent business environment.